Time resolved velocity field measurements are particularly revealing in the transitional and turbulent flow regimes. Tomographic particle image velocimetry offers the ability to map the velocity vector and the full gradient tensor in a three dimensional domain. When coupled with high-speed illumination and imaging hardware, 4D PIV measurements describe the vorticity structure and dynamical evolution of the flow field of interest. The talk introduces the principles of time-resolved 3D PIV measurements and discusses the criteria governing temporal resolution for the tracers motion analysis. The survey of applications covers a wide variety of flows, from turbulent boundary layers, to cylinder wakes, circular and swirling jets. Some recent developments towards large-scale measurements with the use of helium-filled soap bubbles as tracers enable in more recent years the study of full-scale complex problems. This is realised with innovative measurement approaches that make use coaxial volumetric velocimetry and robotics in conjunction. Examples of applications include a vertical axis wind turbine, ground vehicles and speed sport aerodynamics. 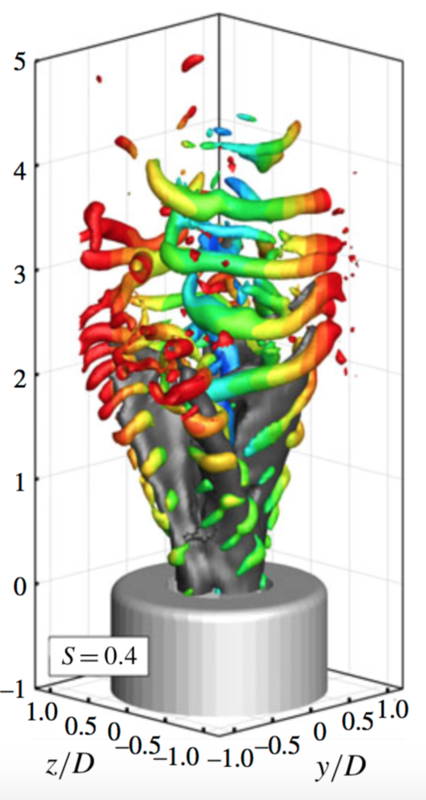 Instantaneous visualisation of vortex organisation for a swirling jet (Swirl number 0.4, Re = 1,000). Iso-surfaces of Q-criterion, colour-code is radial distance from jet axis.